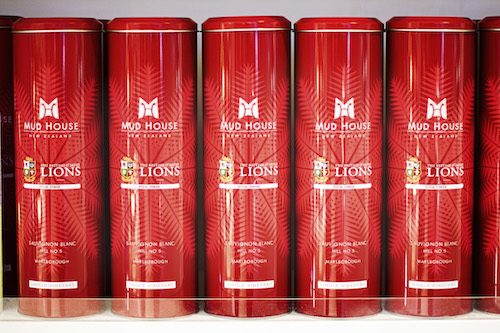 Accolade Wines comes to TFWA World Exhibition (Red Village, J02) having recorded great success with its flagship New Zealand brand, Mud House’s sponsorship of the British & Irish Lions tour. The tournament which was held across New Zealand throughout June, was initially targeted by Accolade Wines’ domestic team in the UK, but the Travel Retail team saw a wider opportunity and used the sponsorship to help drive the Mud House brand within Travel Retail, targeting rugby fans and wine drinkers as they travelled. The team developed a bespoke Travel Retail campaign that linked into the Lions sponsorship and gained large scale visibility in 4 major airports (London Heathrow, London Stansted, Auckland and Sydney). The campaign revolved around a new GTR exclusive, limited edition, commemorative tin for its Mud House Hill No. 5 single vineyard Sauvignon Blanc. Highly visible features and strong calls to action supported the exclusive, limited edition launch and helped encourage travellers to purchase Mud House during the months of May, June and July. Extensive sampling activities were also used to drive and engage passengers. Rupert Firbank, Commercial Director, Accolade Wines, comments, “We wanted to raise the awareness and leverage the Mud House sponsorship of the Lions tour by targeting international passengers across several of our key airports. The introduction of an exclusive, limited edition Mud House tin and the use of large scale visuals helped to increase brand awareness, which not only increased sales for Travel Retail but also added value to our domestic market sales.” In addition, Accolade also launched a bespoke consumer competition in partnership with Dufry, where a lucky winner from the UK who had seen Mud House in Heathrow won a trip for two to Auckland to watch the First Test of the series. Passengers were only in with a chance of winning the amazing prize if they engaged with the hashtag #PourInYourSupport where fans could share their messages of support with the Lions. “We wanted to launch Mud House in Dufy in a unique and exciting way, so this competition seemed like a great way to do that. This was the first multi-market Travel Retail activation that Accolade has run and we are thrilled with the results: the campaign was seen by over 3 million travelling passengers with an estimated 35,000 consumers trialling the wine through over 1200 hours of staffed sampling activity. The GTR exclusive, limited edition commemorative tin was a great success with consumers, many of whom have since asked where they can buy it in domestic!” Adds Firbank. Building on previous branded activities in the UK, Australian and South African airports, this was Accolade Wines’ largest activation yet within Travel Retail, building on its momentum driving the visibility of and engagement with, the wine category within the channel. “Coming to Cannes off the back of such a successful activation gives us a great opportunity to discuss future activations with current and potential retail partners. TFWA World Exhibition is a key date in our calendar and we look forward to welcoming colleagues and friends to our stand,” adds Firbank. Mud House and the Accolade wine portfolio can be viewed in Cannes at TFWA World Exhibition (Red Village, J02).